There are many places we might go to find a suitable definition. Any of the great ecumenical creeds would serve us well in this regard. However, let's stick closer to home and simply reprint Article B—The True God from the Calvary Memorial Church Articles of Faith. Have you ever seen the word "Godhead?" Theologians sometimes use that term when they want to refer to God the Father, God the Son and God the Holy Spirit as three divine Persons in one God. At this point I think we should acknowledge the chief objection to the doctrine of the Trinity, which is that it is absurd. Sometimes the Jehovah's Witnesses (who pointedly deny the Trinity) ridicule it with this little equation: 1 + 1 + 1 = 3. In their minds Christians worship three Gods, not one. The answer is quite simple. The doctrine of the Trinity is not absurd if that's what the Bible teaches. Furthermore, there is more than one way to play with equations. You could also say it this way: 1 x 1 x 1 = 1! What exactly do we mean when we speak of the Trinity? Let's start with the negative and work toward the positive. First of all, Christians don't believe in three Gods. That's a heresy called Tritheism. Second, we don't believe that the Father, Son, and the Holy Spirit are three "forms" of God—like, steam, water and ice. That's the heresy called Modalism. Third, we don't believe that the Father, Son, and Holy Spirit are "parts" or "pieces" or God. That would imply that Jesus is 1/3rd God, the Father is 1/3rd God, and the Holy Spirit is 1/3rd God. B. Where do we find the Trinity doctrine in the Bible? For instance, the Bible contains numerous clear statements regarding the unity of God: Deuteronomy 6:4 tells us that "the Lord is one." 1 Corinthians 8:4 adds that "there is no God but one." 1 Timothy 2:5 explicitly says "there is one God." All Christians heartily affirm this truth. Notice the shift in pronouns. "Let us … in our image … So God created man in his own image. … he created him." From us and our to he. Why the shift? Commentators speak of a literary form called the plural of majesty or the "editorial we." This much is certainly true. If Genesis 1 does not explicitly teach diversity-in-unity within the Godhead, it certainly leaves room for it to be developed later in the Bible. Isaiah 48:16 seems to explicitly refer to all three Persons of the Trinity (with my additions in parentheses): "And now the Sovereign LORD (the Father) has sent me (the Son), with his Spirit (the Holy Spirit)." I'm not suggesting that Isaiah fully understood the Trinity or that the Jewish readers would have understood what it meant, but I do think that in the light of the New Testament, we can say that this seems to be a clear statement of the Trinity in the Old Testament. How could the Son and the Spirit be called God unless they somehow share in God's essence? But if they share in God's essence, they are God alongside the Father. Jesus' baptism—Matthew 3:13-17 (voice of the Father, Son baptized, Spirit descending like a dove). A. Where in the Bible do you find the word Trinity? The word "Trinity" is not in the Bible. Neither is the word "Inerrancy" but we don't discard it simply because it isn't found in the Bible. The issue is not the word, but the concept or the idea. We don't believe in the Trinity because of the word, but because of what the Bible teaches. B. Is there another word we could use? Yes there is. Theologians sometimes speak of the Tri-Unity of God. That's a good word—even though it sounds odd to our ears—because it combines the two ideas of unity and diversity in one word. There is a third word you should know. Sometimes we speak of the "Triune" God. That's also another word that means the same thing as Trinity. C. How can we illustrate the Trinity? A number of illustrations have been suggested. They all are useful as long as you remember they are only illustrations. For water can exist as solid, liquid, or steam. That's okay, but usually water only exists in one state at a time. However, there is a physical condition in which water can exist as solid, liquid and steam at the same time—which would be a much better illustration of the Trinity. There are others we could mention. An egg is made up of a shell, the eggwhite, and the yolk. All three are needed for an egg to be complete. One of the more interesting illustrations note the different roles a person can play. I am a father, a son and a husband at one and the same time. Yet I am only one person. Perhaps a more biblical approach is to consider that a husband and wife are two persons yet in God's eyes they are "one flesh." Add children and then you have the family as a miniature (and very imperfect) version of the Trinity. It's important to remember that all illustrations fail eventually. They don't "prove" the Trinity, they simply help us understand the concept. I am sure that many Christians think this doctrine has no practical value. That is, even if it's true, it doesn't and shouldn't matter to them. However, that simply isn't true. Let me suggest five important ramifications of this truth. A. The Trinity helps us answer the question, "What was God doing before he created the universe?" This is a question little children like to stump their parents with. But skeptics like to ask it as well. You may remember Augustine's answer: "He was preparing Hell for people who ask questions like that!" It also teaches us that God is never "lonely." He didn't create us because he "needed" us. God could have existed forever without us. That he made us at all is a statement of his great love and the wisdom of his plan. B. The Trinity sets the limits on human speculation about the nature of God. C. The Trinity teaches us that God is beyond all human comprehension. After all, if we could explain God, he wouldn't be God. I have no doubt that God is much more than "one in essence, three in Person," but since I can't even understand those simple phrases, I don't worry at all about what else might be true about God. If you feel baffled by the Trinity, join the crowd. The greatest minds of history have stood in amazement before a God so great that he cannot be contained by our puny explanations. D. The Trinity exalts the Son and the Spirit. Let me draw one important inference. 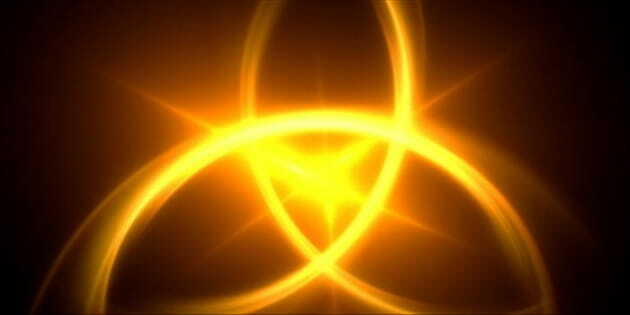 Since all Three Persons of the Trinity are equally God, we may pray to any member of the Trinity. That, by the way, is the number one question I have been asked about the Holy Spirit since writing Names of the Holy Spirit. Many Christians simply do not feel comfortable praying to the Spirit even though we often sing songs that are essentially prayers to the Spirit, such as "Spirit of God, descend upon my heart" and "Spirit of the living God, fall afresh on me." Surely if we may sing to the Spirit, we may also pray to him. If he is God, our prayers may be directed to him. I do agree that Christian prayers will customarily be made to the Father (e.g. The Lord's Prayer). But let us not quibble or imagine that the Father is slighted if we direct our prayers to the Son or to the Spirit, according to the need of the moment. There is no jealousy among the members of the Trinity nor could there ever be. E. The Trinity helps us understand what really happened at the Cross. At the climax of Jesus' suffering, he cried out, "My God, my God, why have you forsaken me?" What do those strange, tortured words mean? We have a hint of the answer in that every other time Jesus prayed, he used the term "Father." But at that moment, when he bore the full weight of the sins of the world, when all that is evil and wretched was poured out upon him, in some way we cannot begin to fathom, God—who cannot look upon sin—turned his back on his own Son. Sin as it were (though not in ultimate reality) caused a rupture in the Trinity. Instead of "Father," Jesus cries out, "My God, my God!" It is God speaking to God. The eternal Son cries out to the Father at the moment when the penalty of sin has been laid upon him. If it be asked, how could one man pay for the sins of the entire race, we find the answer in the doctrine of the Trinity. Only an infinite God could bear the sins of the world! Someone asked Daniel Webster, who happened to be a fervent Christian, "How can a man of your intellect believe in the Trinity?" "I do not pretend fully to understand the arithmetic of heaven now," he replied. That's a good phrase—the arithmetic of heaven. Then, adoring, bend the knee, and confess the mystery." Dr. Ray Pritchard is the president of Keep Believing Ministries. He has ministered extensively overseas and is a frequent conference speaker and guest on Christian radio and television talk shows. He is the author of 27 books, including Credo, The Healing Power of Forgiveness, An Anchor for the Soul and Why Did This Happen to Me? Ray and Marlene, his wife of 35 years, have three sons-Josh, Mark and Nick. His hobbies include biking, surfing the Internet, and anything related to the Civil War.